I wasn't expecting there to be a rankings round-up post this week as I'd assumed all the drivers would have gone to ground, hibernated, jetted off on holiday, you know the kind of thing. Some of them have but others have stuck around long enough to share their thoughts, feelings and plans for the next few weeks. Here we have points for tennis, for fun little videos, for being nice about your fellow drivers and for meeting some VIPs. As always, do keep your suggestions coming in, we had a good haul this week, and I'm curious if we can do the same next week! +2 Fernando Alonso: Celebrating the superhero version of himself. +2 Jenson Button: A pretty terrible edition of the Santander ads, but bonus points for letting them use a student-age picture at the end. 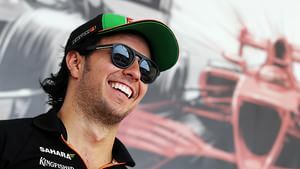 +2 Sergio Pérez: Getting the name of his own team wrong, but a great summer break send-off: "It's much more enjoyable to take pictures... smile all the time." +3 Felipe Massa: Taking up a hobby during the summer break, just a spot of jiujitsu alongside his son. +2 Lewis Hamilton: Meeting Mr POTUS! +2 Susie Wolff: Keeping Toto entertained during his recuperation with some fun and games on the tennis court. +1 Marcus Ericsson: Sharing his summer break plans, which mostly involve training hard. Doesn't sound like much of a holiday! +2 Kamui Kobayashi: Loving the concept of a Kamui exhibition and talk show! +2 Romain Grosjean: Being quite nice about former teammate Kimi Räikkönen, regarding the Finn's current struggles, and what he was like as a colleague.